Your Reason rack just got bigger. All new Reason version 4 comes equipped with a brand new sequencer, a revolutionary groove tool, a stunning arpeggiator and a synth to end all synths. 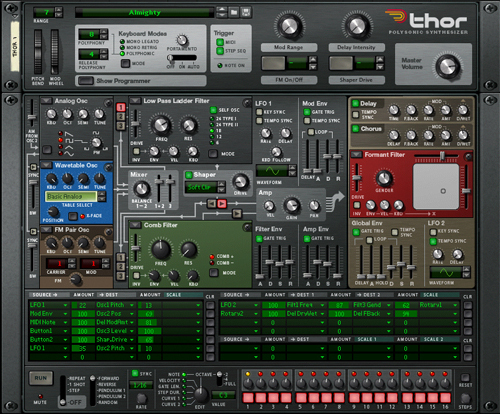 Welcome to Reason version 4 - the bigger rack. A multi-synthesis synthesizer with six oscillator types, four different filters, a step sequencer and a modulation matrix. Fully routable. Fully automatable. Fully everything. A monophonic arpeggiator with multiple play modes, an insert function and a pattern section. And then some. Reason's new revamped sequencer now features multiple track lanes, vector automation, dedicated device tracks, clips, count-in and more. A lot more. A realtime, 32-channel timing and groove handling mixer. 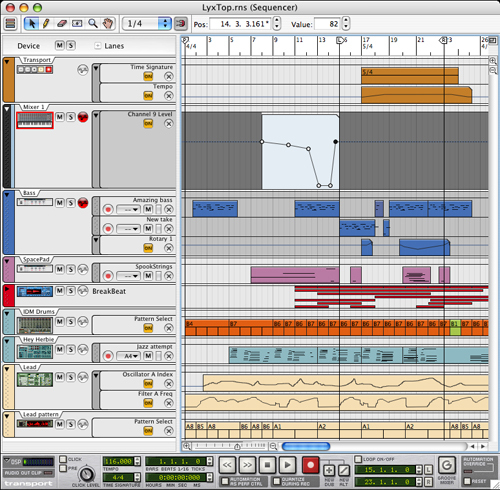 Applies non-destructive, freely editable grooves to Reason's sequencer tracks. Reason now comes in four different flavors. When you install, you can choose between four different language versions: English, French, German or Japanese. The language options means the entire application, from installer to menus and help files, will speak the chosen language! - More Combinator patches, including arpeggio-driven patches using the RPG-8 arpeggiator. One new feature that will quickly ease its way into your workflow is the new Tools Window. This is a floating window containing all your most frequently used tools. Using the Tools window, you can create new devices by choosing from a device palette, fine tune your sequencer data from the Tools pane, or set groove parameters using the groove pane. The device palette (pictured below) lets you drag-and-drop instruments and effects directly to the rack and place them just where you want them. The Tools pane contains all of Reason's sequencer editing tools, allowing for quick access to everything from quantization to vector automation cleanup and legato adjustments. When you hit a channel's Edit button in the ReGroove mixer, the selected groove's parameters show up here for instant editing. Here is also where you can save your own groove files. The Combinator and NN-XT devices have both had minor revisions to make programming patches easier and more powerful. If you are not into making your own sounds, these changes may not mean much to you. If you do like to create your own Combinator setups or NN-XT patches, then you will like this. The NN-XT has been given new features to edit multiple samples simultaneously, to chromatically auto-map samples and a new Group Mono function to let samples play polyphonically, but still be silenced by other samples in the same sample group. The Combinator now has a transpose function that transposes notes sent to a device. Very handy to create splits. Other additions include performance data filters to stop certain types of data from being sent to a device, more flexible choice of Sources in the programmer and a function to automate the receive notes option, making it possible to switch between instruments in a Combinator patch. Вы можете получить более детальную информацию о диске "REASON 4" на сайте производителя. На нашем сайте вы можете скачать или купить почтой REASON 4. Этот товар поступил в продажу в наш магазин 01 Октябрь 2007 г.